The Gaurs face a must-win game against the Lions who are themselves looking to avoid finishing bottom of the table. 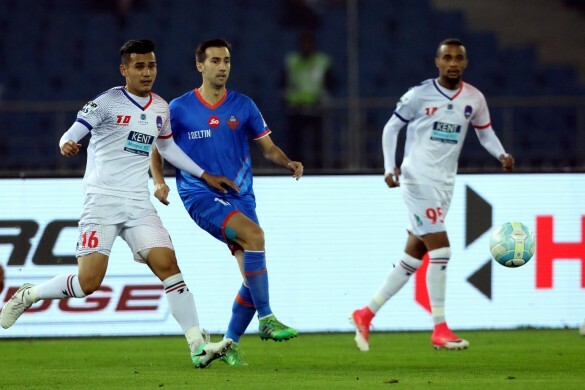 FC Goa hosts Delhi Dynamos FC in the Hero Indian Super League (ISL) 2017-18 at the Jawaharlal Nehru Stadium in Goa on Wednesday. The Gaurs have just a point to show from their last four fixtures, a run of form that has seen them drop to sixth in the league standings. They also come off the back of two consecutive defeats, having failed to score in either tie. Speaking to the media during the pre-match press conference was their head coach Sergio Lobera, and he revealed the game-plan for the next few fixtures and the motivating factor for the same. Before concluding, the 41-year-old also revealed how he selected his team for a particular fixture. Delhi Dynamos FC take on FC Goa in the Hero Indian Super League (ISL) 2017-18 on Wednesday. The Lions, who have had a season of woes, have picked themselves up of late, and are unbeaten in their last two fixtures, the last of which resulted in a 1 – 0 at NorthEast United FC. Though their hopes of making it to the semifinals are up in smoke, a win against the Gaurs will take them to the eighth position in the league standings, a welcome change after being rooted to the bottom for a long time. Addressing the media during the pre-match press conference was the Delhi’s head coach Miguel Angel Portugal, and he stated that his team had improved recently with the last two results being proof. Romeo Fernandes had played his previous seasons in the Hero ISL with his home side Goa but had to make a switch to Delhi this time after the team from the capital city roped him at the Player’s Draft. Portugal was quick to indicate that he was one player who had vastly improved since the initial phase.